Velvet 2-tone shawl scarf with burnout floral pattern on burgundy base is perfect for Tribal and Gypsy belly dance, or wear as an evening wrap! 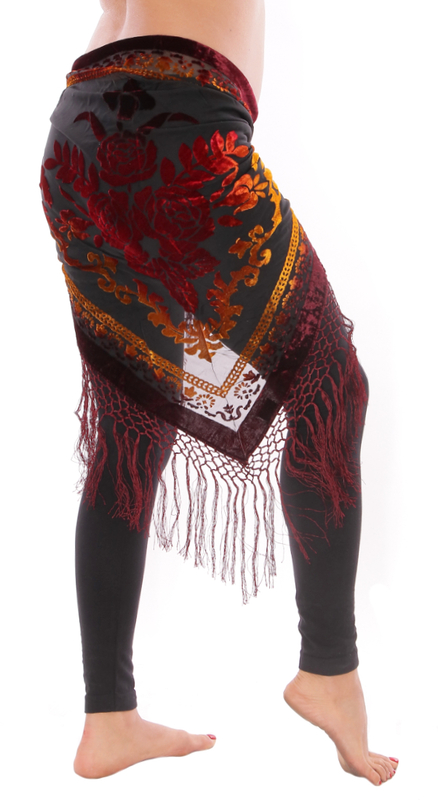 Velvet 2-tone shawl scarf with burnout floral pattern on burgundy base is perfect for Tribal and Gypsy belly dance. Also makes a great evening wrap! Width end to end (top edge)- 64 inches; Length of center line to tip of triangle (not including fringe)- 32 inches. Very pretty hip scarf. I get compliments when I wear it. This was a Christmas gift for my daughter that she requested. I ordered on line and requested that it arrive by December 24 and it arrived promptly. I think it is much prettier than shown in the picture. My daughter was thrilled with it. I know she will get a lot of use out of it. This is the most gorgeous hip scarf. The colours are amazing. I love it. Thank you. The colours are rich and the scarf is nice and big. Thank you! Q: I'm looking at the burgundy base; what color is the embroidery? Thank you for your question. This beautiful shawl scarf is actually not embroidered. It is a burnout velvet fabric that has multiple hues of burgundy, yellows, and oranges creating the floral pattern. The fringe along the edge is a burgundy color. Please, let us know if you have any further questions. Have a wonderful day.